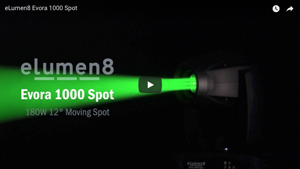 eLumen8, a Prolight Concepts Group company, have recently released their latest range of professional moving heads. With super smooth movements, the agile Evora series feature whisper quiet 3 phase motors, immensely bright LEDs with superior dimming and display battery backup. They are built to withstand the riggers of the road, and come backed by eLumen8’s 2 year warranty. The vast array of onboard features allows lighting designers to easily create stunning, cutting edge effects, wowing audiences. 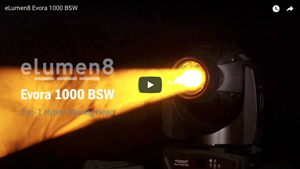 These eLumen8 Evora moving heads have become a fast favourite with Prolight Concept Groups’ in-house marketing and engineering teams, who have combined their skills to design their very own light shows for each of the fixtures. 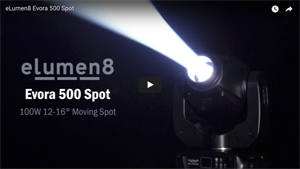 They have then produced a dedicated video for each moving head showcasing their effects and attributes, including how the quick and easy the spring-clip loaded gobos are to change. 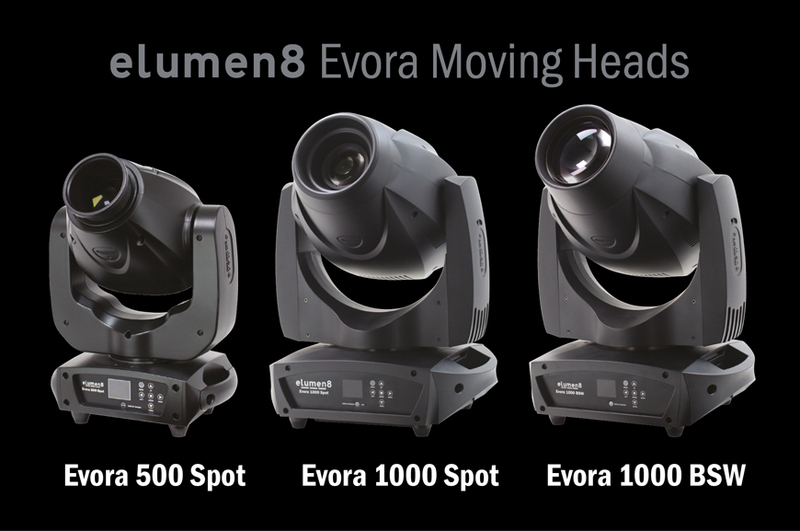 The 3 moving heads within the eLumen8 Evora series have each been designed to give lighting designers and installers an arsenal of professional features and effects needed in today’s event and installation markets. The eLumen8 Evora 1000 BSW is a 3-in-1 hybrid, that features a powerful 180W LED which is ample for most large venues and events. This fixture has the ability to switch between a beam, spot and wash offering a huge potential of creativity for projecting patterns onto walls or generating stunning mid-air effects. Used as a beam effect (4.5°), the unit emits sharp beams of light whilst as a spot (20°) the fixture is capable of stunning projections. When operated in the wash mode (45°) the unit produces soft-edged washes. This version also has 8 facet circular and 6 facet linear rotating indexable prisms, motorised zoom and focus, frost filter, a colour wheel, a static gobo wheel and a rotating, indexable, replaceable gobos wheel. With a host of features, including a super bright 180W LED and colour wheel, the eLumen8 Evora 1000 Spot is an ideal fixture for larger events and venues. These coupled with a 3 facet, indexable rotating prism plus 5 facet linear rotating indexable prism and remote focus produce rich vibrant colours, whilst the 2 gobo wheels (9 static and 7 rotating) provide a host of superb animated effects. Pan/tilt auto correction and 16 bit positioning make this fixture perfect for rental and installation alike. With a 100W LED the eLumen8 Evora 500 Spot sports a host of features inside its compact shell. A 3 facet, indexable rotating prism, remote focus and manual zoom combined with rich vibrant colours and 2 gobo wheels result in stunning light shows to fill any venue. Whilst the 16 bit resolution and pan and tilt auto correction make this little mover ideal for rental and installations alike. The introduction of the feature-packed Evora series not only solidifies eLumen8’s place in the event, stage, production and hire markets, but gives designers a choice of fixtures to use whether they want to produce unique lightshows or enhance existing installations.